Fire units from across North Escambia responded to the report of a structure fire at the International Paper McDavid Sawmill on Champion Drive in McDavid Friday afternoon. The first fire units on scene are reported light smoke showing from one structure as they arrived. Fire units from McDavid, Century, Molino, Walnut Hill and Cantonment responded to the sawmill about 1:00 Friday afternoon. The fire was reported to be out at about 1:15. The third graders at Molino Park Elementary School treated their grandparents to breakfast Friday morning at the school during the school’s Grandparent’s Breakfast. 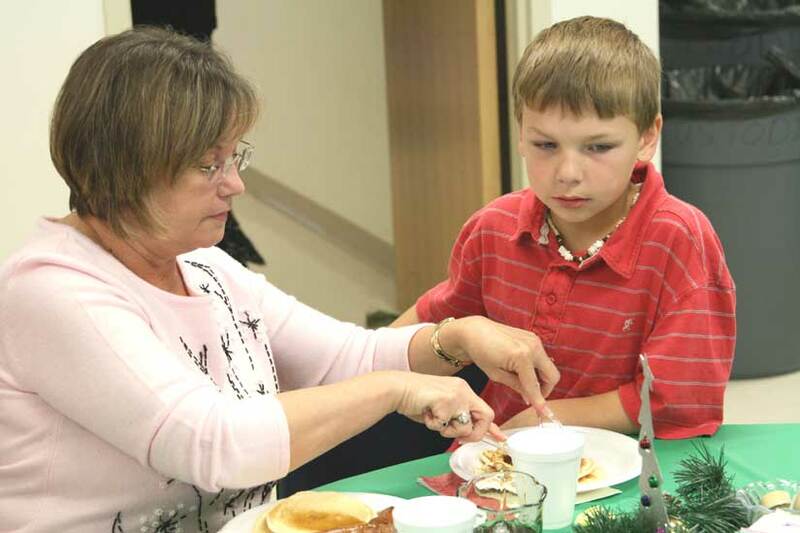 The grandparents and students enjoyed a breakfast of pancakes, sausage and orange juice. The grandparents were also served coffee. About 125 students and grandparents attended the event, which is sponsored by the Molino Park Elementary School PTA. For a complete photo album from the event, click here. Funeral services were held Friday morning for Raymond “Ray” Dewitt Simmons, an off-duty Escambia County deputy found dead early Saturday morning at behind a Walnut Hill church. Funeral services were held at the Faith Chapel Funeral Home North on Highway 29 in Cantonment. Burial followed at Bayview Memorial Park. Visitation was held last night. 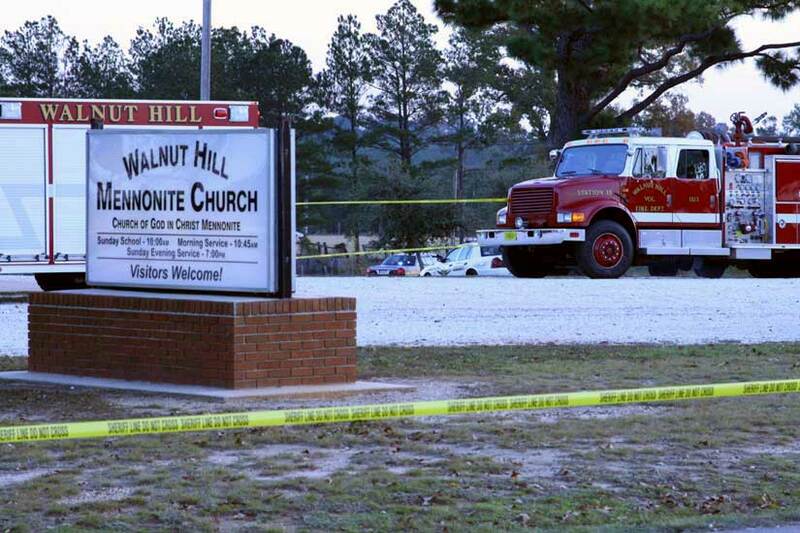 Simmons died from an apparent self-inflicted gunshot wound early Saturday morning in Walnut Hill at the Walnut Hill Mennonite Church at the intersection of Highway 97 and North Highway 99. The deputy’s unmarked cruiser was found parked with blue lights flashing just after 5:00 a.m. on a driveway behind a cemetery that leads from the church’s parking lot to Highway 99. Members of the law enforcement and others are leaving their thoughts and condolences on leoaffairs.com, an online law enforcement community.”Ray was the kind of Lt. that backed up his guys/gals and fought the battles that needed to be fought,” one post on the forum says. “I’ll miss his laughter, the funny stories he would told, his compassion and insightful advice. I feel so blessed to have known him,” says another poster. “Ray Simmons was one of my best friends and the absolute best street cop I’ve ever met . He taught me the ropes and made me the cop I am today. Ray was my favorite cop and I learned something every time I watched him work,” another person wrote on the forum. Simmons had served 14 years with the Escambia County Sheriff’s Department, and was currently serving as a lieutenant. Three Escambia County deputies shot and killed a Century man at his Campbell Road home after he threatened them with a weapon Wednesday night. 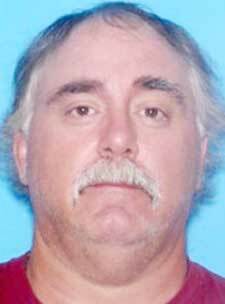 He has been identified as 50 year old Michael Bodi McCormick by the Florida Department of Law Enforcement. Deputies had responded to a call about a man that was possibly suicidal at or near Odom’s Bar in Century before five. 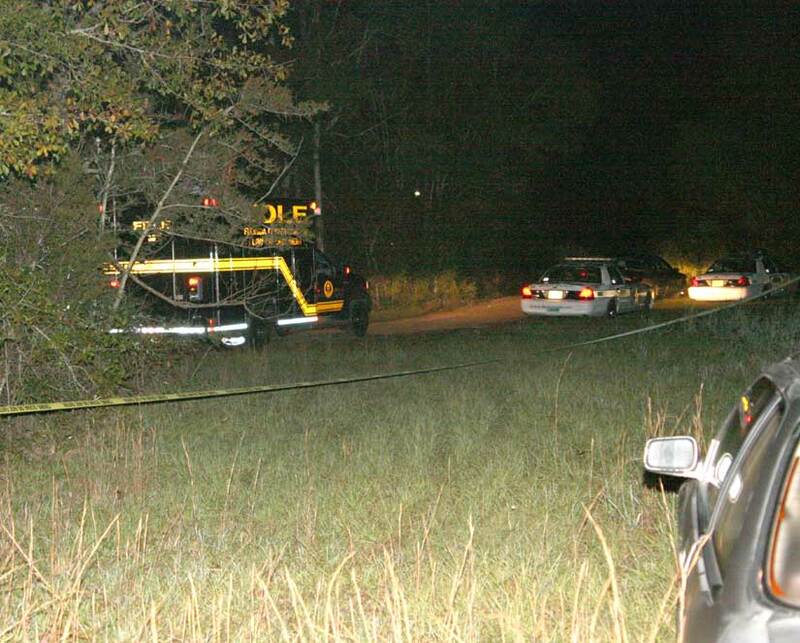 McCormick’s vehicle was spotted near Campbell Sand and Gravel in the area of Campbell Road and Fannie Road. A short vehicle chase followed reportedly, ending with deputies surrounding a house on Campbell Road. 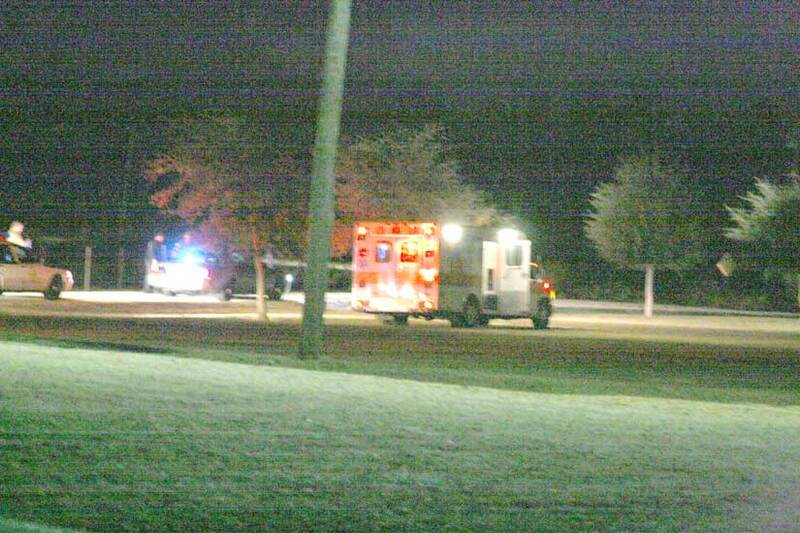 The sheriff’s department helicopter was called to the scene. After deputies surrounded the scene, the McCormick pointed multiple weapons at them, authorities said, with the shooting taking place after five o’clock. Officials declined to say how many times he was shot. Three deputies have been placed on paid administrative leave following the shooting, which is standard procedure. They have have not been identified, and none of the three were injured. 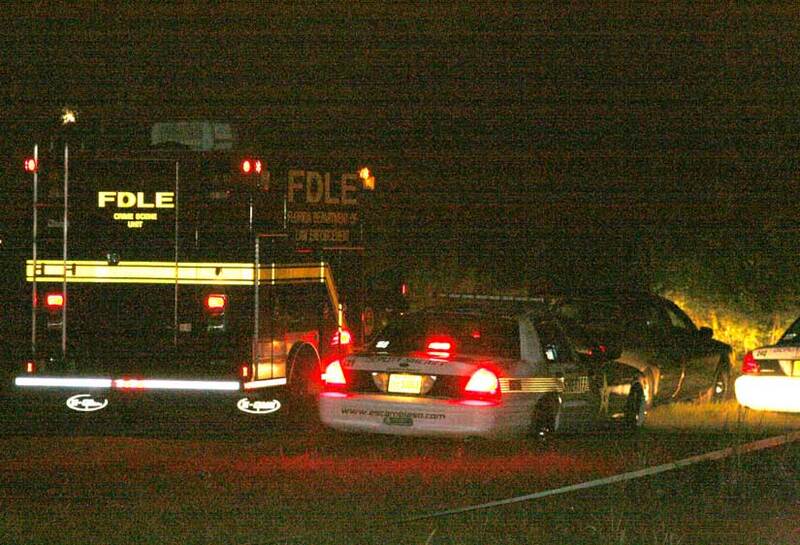 The shooting is under investigation by the Florida Department of Law Enforcement, which is also standard procedure following a deputy-involved shooting. More details will be posted as soon as they become available. Escambia County public school students will brought home their second nine weeks Progress Reports on Wednesday. By Thursday, students should have also brought home a letter from the Florida Department of Public Health titled “Preventing Staph Infections”. The school district used its Connect-ED phone notification system Tuesday night to alert parents to be on the lookout for the letter. The letter highlights ways to avoid a staph infection, and stresses the importance of frequent handwashing. To view the letter in pdf format, click here or on the picture of the letter. The letter also addresses MRSA (methicillin resistant staphylococcus aureus), which is a type of staph infection that is resistant to antibiotics. 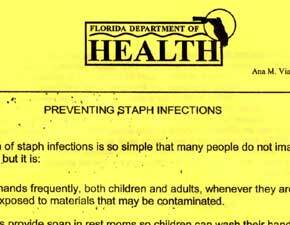 “The Florida Department of Public Health does not recommend closing schools for cleaning when children have skin infections caused by staph because it is not an effective means of protecting children,” the letter states. No staph outbreak has been reported at any North Escambia school. Two cases of staph, one of which was reported to be MRSA, were acknowledged about a month ago at Bellview Middle School in Pensacola. The Cantonment Rotary Club, along with Wal-mart, donated 300 smoke alarms to Escambia County Fire Rescue Chief Ken Perkins Wednesday at the club’s meeting at Saint Luke United Methodist Church. The smoke alarms will be used as part of Escambia County Fire Rescue’s smoke alarm/home fire safety inspection program. For more information on the program, residents can call 595-HERO. An apparent sonic boom rattled the area about 10:20 Tuesday morning. The rumbling lasted about five seconds at the NorthEscambia.com offices Walnut Hill, where the windows rattled and the sound very much appeared to come from the southwest. According to the National Weather Service office in Mobile, the weather Tuesday morning was perfect for a sonic boom to have traveled a great distance, even from out over the Gulf of Mexico. Residents from across Mobile, Baldwin and north Escambia counties reported hearing and feeling the boom. Whatever it was, it was not an earthquake, according to the U.S. Geological Survey. The National Earthquake Information Center reports no earthquake activity anywhere near south Alabama or northwest Florida. Their realtime earthquake map, pictured above (click to enlarge), does not indicate any activity in the area. If you felt the boom, please click here to contact us and let us know. The paychecks of Escambia County public school teachers are going up next year, thanks to an 8.26% pay increase approved Tuesday night by the Escambia County School Board. The minimum starting salary for a first year teacher with a bachelor’s degree will rise from $29,105 to $32,000 beginning with the 2008-2009 school year. The maximum pay for a teacher with a bachelor’s degree and about 25 years with the system would go from $48,197 to $50,000. A master’s degree earns teachers a $4,500 yearly bonus and board certification brings another $3,800 a year. “It took about seven years to get to this point,” said Bill Vincent from the Escambia Education Association. He was referring to a five year step increase plan that culminated with the school board’s vote Tuesday night. 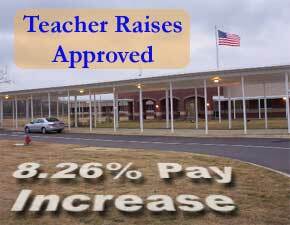 That plan was intended to bring Escambia County teacher salaries in-line with state averages. “We still have work to do in the middle and top to be competative,” he said. The average pay for teachers in Escambia County last school year was about $39,000. That compares to about $43,000 in neighboring Santa Rosa County and about $47,500 in Okaloosa County. The state average was about $43,200. Vincent, who is the Escambia Education Associations bargaining representative, said 96.5 percent of teachers and 95% of support personnel in the system had voted in favor of the school board’s plan. In other business, the Escambia County School Board voted to postpone approval of the the 2008-2009 school year calendar until their February meeting. District 2 Member Gerald Boone expressed a desire to see the semester end by the time students start their 2008 Christmas break. Under the currently proposed calendar, students would return from Christmas break to being semester and district exams. appointed Francis Gindl as an Ernest Ward Middle School teacher effective 10/15/07. appointed Charlyn Madison as a Carver/Century teacher effective 10/25/07. accepted the retirement of Carol Hopkins as Reading Coordinator at Northview High School effective 10/31/07. She had been a teacher for 40 years. promoted Sonja S. Allen to Food Services Assistant II at Carver/Century effective 10/10/07. promoted Christine A. Barrett to School Data Specialist I at Ernest Ward Middle School effective 10/03/07. appointed Charlotte B. Giddins as a teacher assistant at Ernest Ward Middle effective 10/15/07. accepted the retirement of Donna M. Miller as a custodian at Ernest Ward Middle effective 10/03/07. 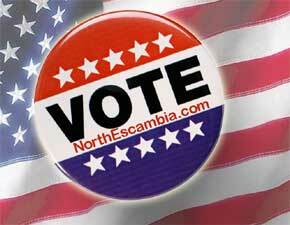 Three republicans have prefiled for the District 5 Commission Seat that includes the North Escambia area. Incumbent Commissioner Kevin White prefiled back on January 29 of this year. Chris Washler of Cantonment filed August 27, and Randall E. McCrackin of Cantonment filed this past Tuesday, November 20. As of September 30, White had raised $32,405 in contributions, loans and in-kind contributions. Those contributions included a $200 loan from the candidate, who lists his occupation as an auto repair shop owner. His expenditures totaled $431.70 as of September 30, mostly for postage and printing. Click here to view White’s campaign finance reports in pdf format. Washler had raised $1,244.45 as of September 30. That amount included a $300 loan and and $44.35 in in-kind contributions from the candidate. He had spent $30.61 on office supplies. Click here to view Washler’s campaign finance reports in pdf format. McCrackin has not been required to file a campaign finance report to date, as he was not a candidate when the last report was due on September 30. The candidates’ next finance reports are due by January 10, 2008, for the period that ends December 31, 2007. The primary election is scheduled for August 26, 2008. The prefile deadline for local offices is noon on May, 19, 2008. NorthEscambia.com will have complete local election coverage over the coming months. Molino area churches held a community Thanksgiving service at Highland Baptist Church Tuesday night. At least nine different churches from different faiths were represented at the service, with area members from Aldersgate Methodist, Crossfaith Church, Highland Baptist, Molino First Assembly, Olive Baptist, Hillcrest Baptist, First Baptist Cantonment, Northend Community Church and Victory Assembly present. A joint Community Choir under the leadership of Phil Jones performed, as did the Highland Kids Klub, the Highland Youth Drama Team and the Highland Ensemble. 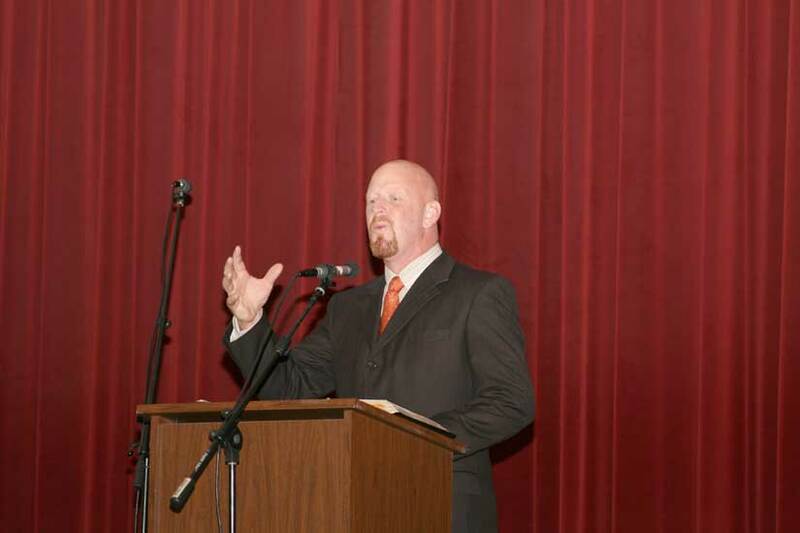 The message was brought by Pastor Brian Calhoun (pictured above) of Highland Baptist. Pastor Tony Schachle for Northend Community Church, Pastor Rob Hines from Crossfaith Church and Pastor Jeff McKee from the Victory Assembly of God also participated in the service. The offering from the service will be used to aid needy community families at Christmas. North end churches gathered Sunday night at Northview High School for a Community Thanksgiving Service. Molino area churches will hold a community-wide service Tuesday night. Five churches – Bratt First Baptist, Century First Baptist, Dogwood Park Baptist, Poplar Dell Baptist and Walnut Hill Baptist – provided the music for the service. 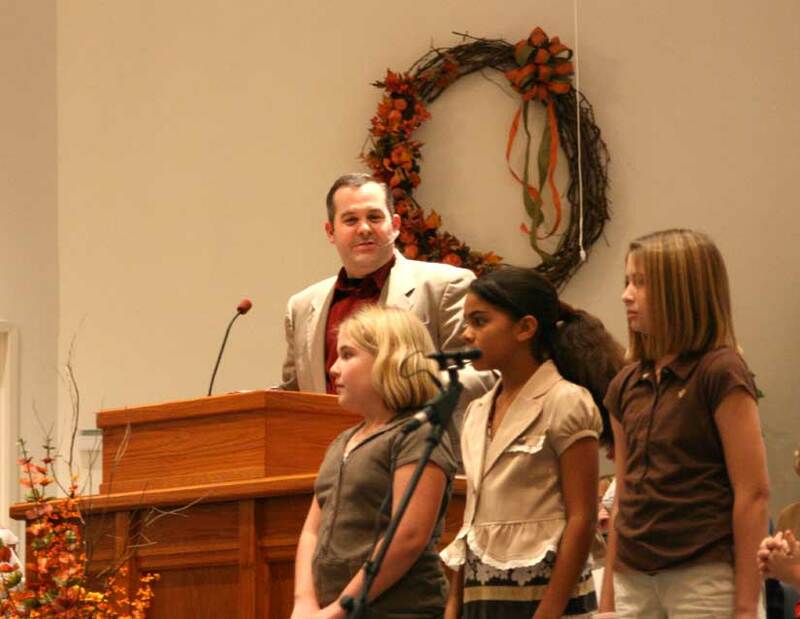 The message was brought by Pastor Ted Bridges (pictured below) from Walnut Hill Baptist. “It’s great to see you working together,” said Kim Johnson, director of church development for the Pensacola Bay Baptist Association told those in attendance. “It is a great testimony of who our God is,” she said. The north end churches have held this service for several years. This year’s service at Northview was “hosted” by Dogwood Park Baptist Church. Canned good donations were collected for the Manna Food Bank. The area churches have also pledged $500 to the Manna Food Bank. The collected food will be distributed by Manna at their Davisville and Century distribution points, said Dogwood Park pastor Glenn Milstead. Click here for more photos from the Northview event, including photos of each choir.